Purpose To evaluate the time-intensity curve (TIC) parameters on contrast-enhanced ultrasound (CEUS) for early prediction of the response of breast cancer to neoadjuvant chemotherapy (NAC). Materials and Methods This prospective study included 41 patients with breast cancer. CEUS was performed before and after the first cycle of NAC. TIC parameters were analyzed for different regions of interest (ROIs). ROI 1 targeted the hotspot area of greatest enhancement, ROI 2 delineated the area of hyperenhancement, ROI 3 included the entire tumor on grayscale ultrasound, and ROI 4 encircled the normal parenchyma. The TIC perfusion values for ROI 1, 2, and 3 were divided by the ROI 4 value. Results 11 (26.8 %) of the 41 patients showed a good response (Miller-Payne score 4 or 5) and 30 (73.2 %) showed a minor response (Miller-Payne score 1, 2, or 3). There were significant differences in the wash-out area under the curve, the wash-in and wash-out areas under the curve on ROI 1/4 after the first cycle of NAC, pre-NAC mean transit time local (mTTl) on ROI 2/4, and pre-NAC mTTl on ROI 3/4 between good and minor responders (area under the receiver-operating characteristic curve > 0.70, p < 0.05). Conclusion Some TIC parameters obtained by CEUS may allow prediction of the response of breast cancer to NAC at a very early time point. 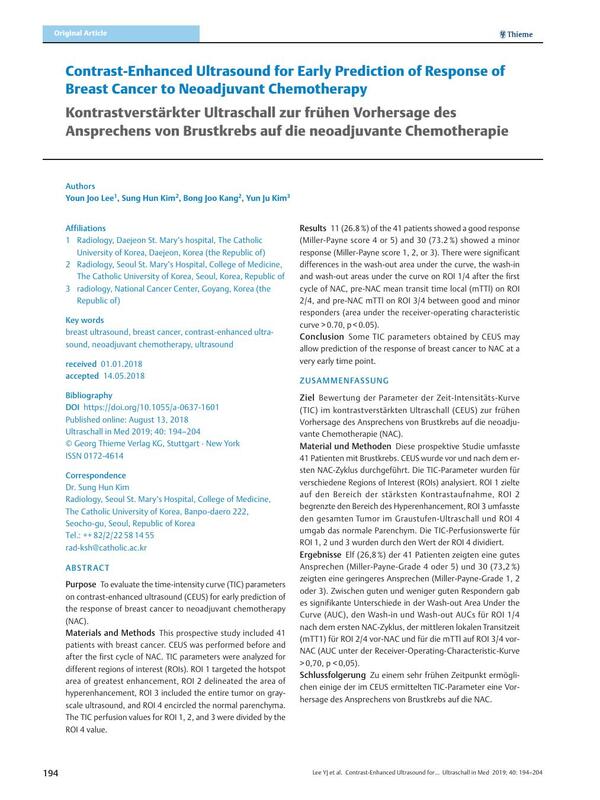 Ziel Bewertung der Parameter der Zeit-Intensitäts-Kurve (TIC) im kontrastverstärkten Ultraschall (CEUS) zur frühen Vorhersage des Ansprechens von Brustkrebs auf die neoadjuvante Chemotherapie (NAC). Material und Methoden Diese prospektive Studie umfasste 41 Patienten mit Brustkrebs. CEUS wurde vor und nach dem ersten NAC-Zyklus durchgeführt. Die TIC-Parameter wurden für verschiedene Regions of Interest (ROIs) analysiert. ROI 1 zielte auf den Bereich der stärksten Kontrastaufnahme, ROI 2 begrenzte den Bereich des Hyperenhancement, ROI 3 umfasste den gesamten Tumor im Graustufen-Ultraschall und ROI 4 umgab das normale Parenchym. Die TIC-Perfusionswerte für ROI 1, 2 und 3 wurden durch den Wert der ROI 4 dividiert. Ergebnisse Elf (26,8 %) der 41 Patienten zeigten eine gutes Ansprechen (Miller-Payne-Grade 4 oder 5) und 30 (73,2 %) zeigten eine geringeres Ansprechen (Miller-Payne-Grade 1, 2 oder 3). Zwischen guten und weniger guten Respondern gab es signifikante Unterschiede in der Wash-out Area Under the Curve (AUC), den Wash-in und Wash-out AUCs für ROI 1/4 nach dem ersten NAC-Zyklus, der mittleren lokalen Transitzeit (mTT1) für ROI 2/4 vor-NAC und für die mTTl auf ROI 3/4 vor-NAC (AUC unter der Receiver-Operating-Characteristic-Kurve > 0,70, p < 0,05). Schlussfolgerung Zu einem sehr frühen Zeitpunkt ermöglichen einige der im CEUS ermittelten TIC-Parameter eine Vorhersage des Ansprechens von Brustkrebs auf die NAC.